Here at Resmar we are proud to be associated with the DBI Sala range of height safety equipment. The Exofit NEX full body harness is a state-of-the-art full body harness that has a number of advanced features making it a premium next-generation safety harness. The highly superior X-Design is made to wrap around the wearer, providing the ultimate in comfort and security against tangling. The ultra-soft edging moves with the wearer and reduces the possibility of rubbing or chaffing and is extremely comfortable and reliable. It wraps around the wearer ensuring tangle free donning and security and confidence. It has been designed in a way so that it cannot slip as the hip, leg and shoulder padding is built into the harness. Dryness and comfort is guaranteed by the breathable lining and it also features memory -fit so that once it is adjusted and locked it will stay in place and prevent any possibility of slipping. The Exofit NEX also features the revolver vertical torso buckles allowing easy adjustment of the shoulder straps as well as DUO-Lok quick connect buckles with memory fit web-lock, which ensures perfect fitting every time. The harness has integrated suspension trauma straps which will give relief in a fall as well is moulded lanyard keepers which will easily take larger hooks and are designed to break away in order to avoid a possible trip hazard. 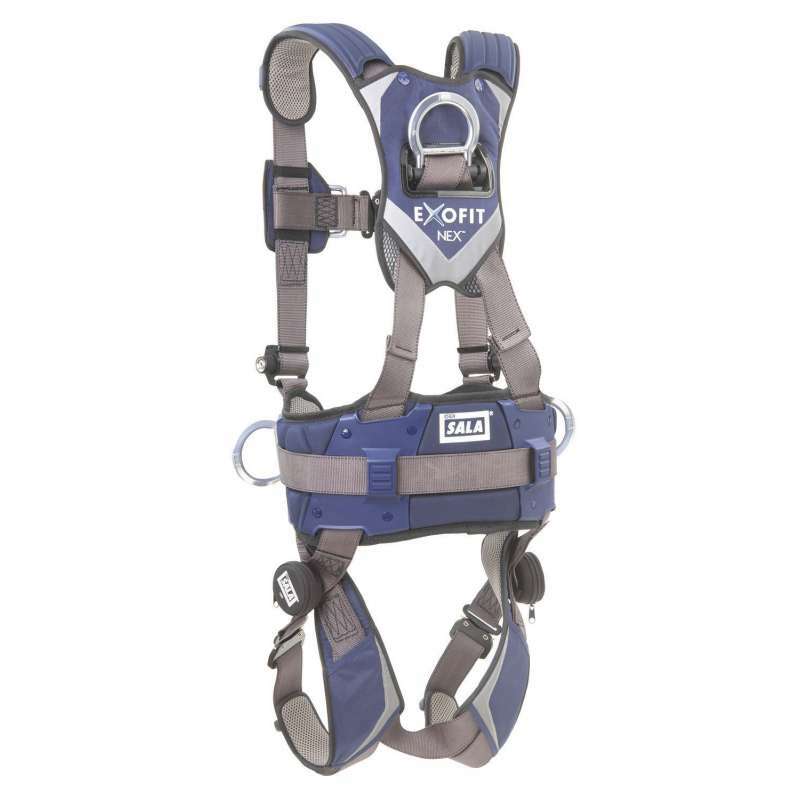 The lightweight aluminium D rings (Tech-lite) and REPEL web technology ensures this is a highly moisture and abrasion resistant harness system. It is rated at 420lb carrying capacity with a built-in chest label covering, cell phone pouch and also features reflective materials on the front and back the harness ensure the highest possible visibility in low light. Additional protection for the wearer is provided by the rigid padding loops, the spring-loaded stand-up dorsal D-ring allows for simplicity and safety with regards connections.